This article is part of a series about our recent vacation in Alaska. To see the introductory article in the series, click here. We ventured back into downtown Anchorage for breakfast. We tried a restaurant that was well rated on Yelp only to find that it had a long wait, so we opted instead for a more modest but still excellent coffee shop. From our window seats, we could see preparations going on for some event on the streets. After breakfast, we asked one of the workers, who was very friendly and helpful. It turned out that they were setting up Anchorage’s Solstice Festival, which started about noon. Unfortunately, we had to be on our way before that. Our first day of travel was primarily east on the Glenn Highway to Glennallen, then south on the Richardson Highway a short distance to Copper Center. The road out of Anchorage was, unexpectedly, a six-lane freeway. We like to do picnic lunches on road trips like this, so on our way out of Anchorage, we stopped at a Wal-Mart for a cooler, food, and plates and such. Wal-Mart isn’t where we typically shop, but it was efficient. The freeway ended where the Wasilla traffic split off. We stopped briefly at a visitor center in Palmer, the agricultural center of the region. The very long summer days permit the growth of record-sized vegetables, and we got some information on where those might be seen for later in the trip. 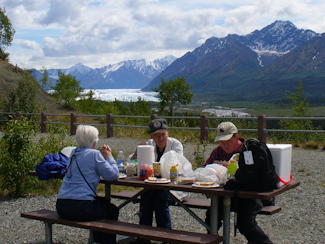 We continued east on the Glenn Highway to a state park area overlooking the Matanuska Glacier. It was a clean and quiet area with a couple of picnic tables with an excellent view of the glacier. After lunch, it got much busier when a tour bus and other visitors showed up, and we took a short hike on the 1-mile nature trail. Continuing to the town of Glennallen, the roadside scenery became less attractive as it was dominated by black spruce trees, many of which were dead or dying. We learned that these trees are growing on a relatively thin layer of soil atop permafrost, which did not support them well, leading to “drunken trees” that look like they’re about to topple. Soon the Wrangell Mountains became visible in the distance, and provided new scenery. Just after turning south on the Richardson Highway, we came to the headquarters and visitor center for Wrangell-St. Elias National Park. 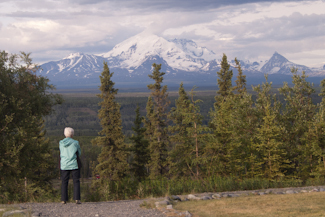 Prior to this trip, I was largely unaware of Wrangell-St. Elias, despite the fact that it is the nation’s largest national park, five times the size of Yellowstone. Large portions of the park are glaciated and wilderness, and it extends into Canada, becoming Kluane National Park there. We watched a short video and got some sightseeing tips from the rangers before continuing to our hotel. We are visiting the Park tomorrow. We are staying overnight just outside the town of Copper Center at the Copper River Princess Wilderness Lodge. We got an idea of the extent of the wilderness here as we drove in, when we saw a couple out walking, talking on their respective cell phones. The Lodge is beautifully decorated in a wilderness theme, and was relatively new, having been built in 2002. It is operated by Princess Cruises, and a number of the other guests were visiting as part of a cruise package. In many respects it reminds me of one of the Disney hotels in terms of the style of decoration and the attention to detail. The Lodge has large windows and spectacular views of the Wrangell Mountains to the east.